Even if you didn't see the hit documentary "Jiro Dreams of Sushi," you'll still want to eat at this West Village sushi spot. 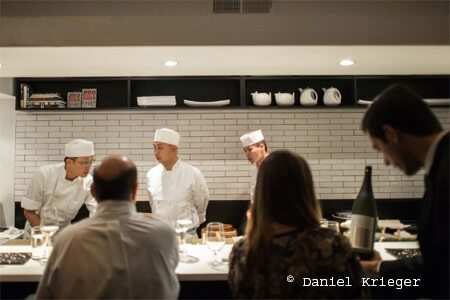 : It's easy to be awestruck when you dine at Sushi Nakazawa. Consider the credentials of chef Daisuke Nakazawa, who apprenticed with Japanese sushi master Jiro Ono, his humble role in the acclaimed documentary "Jiro Dreams of Sushi," or the difficulty in attaining a reservation at his sushi bar, and you'll quickly understand. Enter the unassuming storefront on a side street in the West Village to encounter a striking black and white front room with a white marble counter, white subway tiles and black leather stools, comprising the setting for the dinner/theater sushi bar experience that awaits. You'll need some computer dexterity (and luck) to score the ten sushi bar seats, which are only bookable online and in twos, starting at one minute past midnight. (Tables in the back allow for a quieter meal where reservations for more than two people are possible.) But that's not the real story --- it's the prix-fixe omakase feast. Twenty or so pieces of fish, each one elegant and special, are prepared by chef Nakazawa and his four sushi chefs to bring out their beauty and texture, highlighted only with a minimum of salt, pepper, yuzu or other enhancements, or sometimes torched for maximum effect. Regardless, the fish is the star, selected for you with obsessive precision, with pedigrees from Japan, Boston, California and New York, and some with names so complicated that chef Nakazawa presents them by showing their pictures on his iPad. Ono's "test" dish, the sweet and silky egg tamagoyaki, is a Nakazawa masterpiece. Hay-smoked salmon is something from a sushi dream. Four pages of sakés and two saké pairings are offered; a sommelier will also help you choose wine, if you prefer. Dessert is not forgotten, as there's an equally simple but eminently satisfying creation of ice cream with a raspberry and pomegranate seeds.